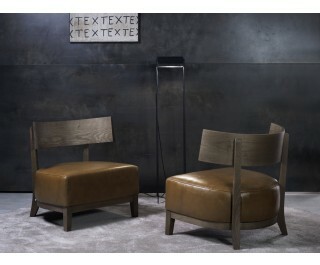 Small armchair with solid ash structure, covered in leather, eco-leather or fabric of the collection. Fixed or removable fabric. Available finishings: FN natural ash, CL american cherry, WG wengé, NC walnut, TB tobacco, open pore matt lacquered ( L21 white, L29 pearl, L23 cappuccino colour, L25 smoke grey, L22 black, L24 red ).